ONLY the English game client is supported in this version! German or French client is NOT supported! Fully costumizable layout. Change the size, position, color and font of your raid interface. 24 player raids are now supported. Dread effects and morale bubbles are now supported. 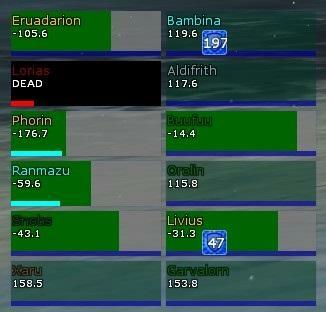 Significant performance improvement when tracking effects (buffs/debuffs). > RaidHealz relies on ressources from CombatAnalysis. In order to make RaidHealz work, you'll need to download the CombatAnalysis plugin. You don't need to load CombatAnalysis in-game. Just make sure the CombatAnalysis folder is in the correct directory (your "Plugins" folder). > If you are unfamiliar with hex color codes simply google e.g. "hex code purple". > Some of the options are tagged with [NYI]. That means this option is not yet implemented in the current version. > Keywords for tracking effects must include the correct upper and lower case characters. E.g "Do Not Fall" will work but "Do not Fall" will not. IMPORTANT: If you costumize your layout, make sure you only use valid characters in the text boxes. For example if you accidentially enter a line break in one of the text boxes (line breaks are only allowed in the effect list), or an invalid hex code and then click the "accept" button, a corrupt plugindata file will be created and it most likely breaks the plugin. So only use numerals, valid hex codes, etc. Have you considered adding the file for meta-info so the plugin can be installed with PluginCompendium? Last edited by Hyoss : 07-11-2016 at 12:12 PM. This looks like a good plugin. The ability to use Compendium would be nice. I am unable to get this to load despite following the instructions. Disregard. I got the plugin to load. I was able to add it to Compendium. Nice work! This is awesome! Any chance of supporting full 24 player raids in the future? Or the ability to choose which 12 out of a 24 player raid to have in the Raidhealz window? We often have larger raids with players coming and going throughout. When new players join, Raidhealz pushes out the current players for the new players with no control that I have been able to find. Please update this wonderful app to include either of these changes. I am currently working on a new version of RaidHealz which will include support for 24 players and a bunch of other new features and fixes. If everything is working out well then you can expect the new version to be released in 2-3 weeks. Last edited by Eruadarion : 09-17-2017 at 01:08 AM. I saw an article on the forums about an old plugin called SortPack and decided I wanted to try it. Thurallor, posted in the thread that he had written a patch for listbox controls to accommodate SSG's latest changes. When I applied the patch, it seems to have triggered a race condition in your script. Here's the address to the forum. If you are open to suggestions, perhaps you could create a button to show and hide the plugin. Something similar to combat analysis. I think this would be helpful. Thank you. thanks for your work and sharing it here. This is great plugin for raidz, probably only one with so many customizations. I found a bug placing effect icons left or right doesn't really move them to the end of left or right. it's a bit left and a bit right. also middle-left and middle-right are swapped I think. You can type /rh_visible and /rh_invisible in chat (or you can use shortcuts to essentially make it a button). Thank you for letting me know. Should be easy to fix. I will make sure to have it fixed for the next version! It might very well be that middle-left and middle-right are swapped. I will check it and include a fix in the next version. Thank you for bringing it to my attention! Last edited by Eruadarion : 03-12-2019 at 08:31 PM. Hi, I'm trying to load the plugin, I can see it in my plugin manager. It doesn't load however through the Plugin Manager, nor through a manual /plugin load raidheals (message given is "Unable to load "RaidHealz"). Do you have any suggestions for getting this to load? Thanks! Make sure you are not loading the RaidHealz-Reloader but only RaidHealz in your Plugin Manager (both Plugins are needed, but only RaidHealz should be loaded manually). Make sure you have CombatAnalysis in your "Plugins" directory. I was lazy and just copypasted some CA code for RH without thinking about that this code would still include file paths pointing to other CA ressources. Sorry - I'll fix it in the next patch. Make sure you have the "Turbine" folder (also included in the RH download) in your "Plugins" directory too. RH uses a file named class.lua from the Turbine folder. Make sure you don't have a corrupted file in your PluginData directory. Navigate to your account name, your server name and finally your character name and check if there's a RaidHealz_Settings.plugindata file. If there is such a file, delete it. Make sure you are using the English game client. Other languages are currently not supported.